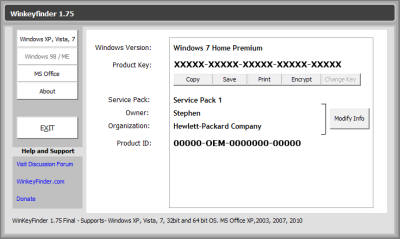 There are several reasons why you may need your Windows 7 product key. For example when you purchase a new PC you may not have received a system disc. There are ISOs of the various Windows 7 versions freely available online, for example from Microsoft and Amazon.com, which you can use to make your own installation disc, but you need your Windows 7 product key. Prior to XP the Windows product key was stored in the Windows Registry in the key HKEY_LOCAL_MACHINE\ SOFTWARE\ Microsoft\ Windows\ CurrentVersion\ ProductId. However with Windows XP and later versions the product key is encrypted in the Registry. You'll need a product key finder utility to read it. WinKeyFinder is a free, small, easy to use Windows 7 product key finder that requires no installation. Download the utilitie's zip file from WinKeyFinder or another reputable source. If directed to download a download manager, do not download it. You don't need a download manager to download a 91.4KB file, and most file servers have this function built-in. Download managers can be used to install spayware on your computer. The latest WinKeyFinder archive as of this writing is named: WinKeyFinder175.zip. 1. Create a folder on your desktop i.e. named WinKeyFinder. 3. Inn the Select Destination and and Extract File dialog box that appears, click on [Browse...] button and navigate to your folder. 4. The path to your foldershould appear in the Files will be extracted to this folder: text box. Click on [Extract] button. 5. Double-click on the .exe file and in the Security Warning message box that appears, click on the [Run] button. 6. In WinKeyFinder click on [Copy],[Save],or [Print] as desired. 7. Close WinKeyFinder by clicking on the [Exit] button. • MSCORSVW.EXE Hogging CPU resources?